According to exhibitor’s research, a live presentation is the third critical reason why people remember the exhibiting company. Numbers one and two are booth size and product interest. If you have a limited exhibiting budget, hiring a professional trade show entertainer is a cost-effective way to attract attention to your company without springing for the larger, expensive trade show booth. Magical Balloon-dude Dale is a professional trade show entertainer who understands the exhibitors requirements of driving booth traffic and sales, create brand loyalty, create visibility and awareness, change and reinforce company image, and showcase industry support and partnership, all while making the attendees experience fun. Dale will help promote your trade show booth by working with the trade show marketing team to develop event flyers, posters and brochures, poster for event attendees, and provide press release coverage. 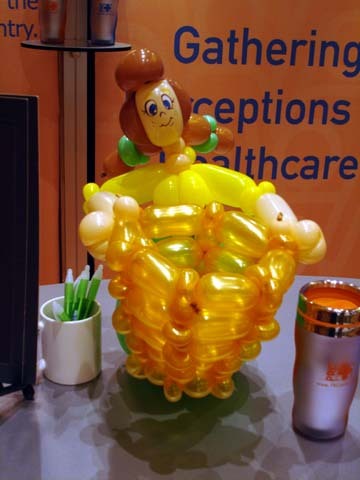 Exhibitors can increase show attendance and booth traffic by coordinating Magical Balloon-dude Dale’s artistic balloon twisting into their presentations creating a customized product that helps to reinforcing a concept with your entire product or service. Dale worked with trade show marketing team at Professional Research Consultants to develop balloon designs for this 8.5 x 11 flyier to help promote Dale's appearance at SHSMD conference in Phoenix, AZ. PRC Marketing & Events Manager Jessica Gochenour said "We hired the best balloonist, to make the worst balloons for this flier." Dale’s trade show entertainment skills have allowed him to work with Harrah’s Casino, Jewel Foods, Bank One, Meridian Air Travel, Professional Research Consultants, Cardinal Health, Air Duct Doctors, A. J. Wright, Panda Express and numerous other companies trying to get public reorganization or showing product/service loyalty. 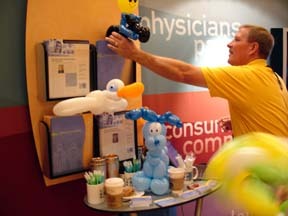 Trade show entertainer Magical Balloon-dude Dale reaches a new level with combining Dale's outgoing personality with crowd stopping artistic skills. 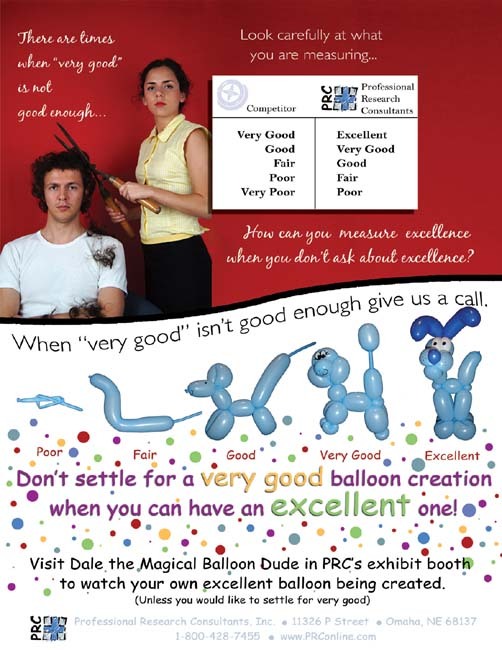 Hire a professional promotional entertainer to work your trade show booth; hire an trade show specialist Magical Balloon-dude Dale. Ideas 4 Events has unique trade show booth attractions such as a cash cube money machine or high-tech interactive games and many other trade show attractions to choose from. Looking for tradeshow giveaways try Promotion Store.com for great prices and selection. For more trade show marketing ideas visit Trade Show Marketing.